You’ll find a vacation-full of activities at Campers’ Paradise. 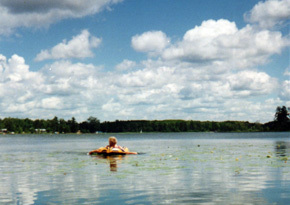 Part of the famous Mantrap Chain, Lake Belle Taine is seven miles long, marked by bays and inlets and connected by river to other lakes in the chain. Water clarity and quality are excellent, and the lake abounds with walleyes, northerns, crappies, sunfish, bass and muskies. It’s also home to a host of waterfowl including Minnesota’s state bird, the loon, whose haunting call wafts across the waters at dawn and dusk. Watch for the nesting pair of eagles fishing to feed their young! Our sugar-sand main beach offers swimming, water trampolines, funtastic play structure, beach volleyball court and horseshoe court. Catch a “sunny” for supper off our fishing bridge on the Campers’ Paradise causeway. 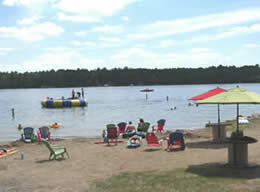 Lake Belle Taine boasts walleyes, northerns, crappies, sunfish, bass and muskies. 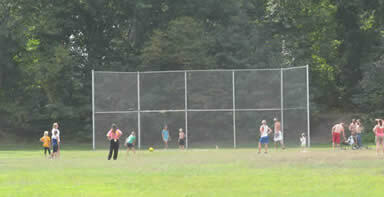 Play a friendly pick-up game of baseball, kickball or soccer on our groomed sports field, complete with soccer nets, baseball backstop, benches and bases. It's also a great space for stargazing and kite flying! 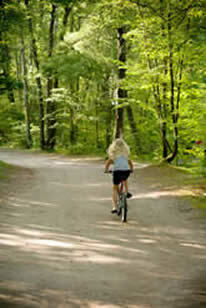 The sandy roads of Campers’ Paradise and the nearby Heartland trail beckon bicyclists. Bring your own or rent from us. Check out our fitness map with distances for all the Island's roads and trails. Launch your own boat at the Nevis dock, then park your trailer in our designated lot or rent one of our fishing boats, canoes, kayaks or pontoon. Play air hockey, foosball and video games or listen to tunes on the juke box in our historic, rustic lodge. Restrooms, showers and washer and dryer provide the conveniences of home. 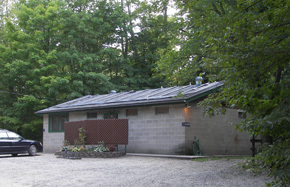 Water for the facility is pre-heated with our rooftop solar-heating system.